The story starts right after the developments in Storm’s Heart. In order to save his friend’s life, Rune made a bargain with Carling, the Vampyre’s Queen. Now he is on his way to make good on his part of the deal, even if he doesn’t know exactly what Carling is going to ask of him. What Rune finds is a vampyre sentenced to death (because a disease is killing her) and he is stuck in the middle of a helpless situation. In my opinion out of the three books this is the one with the best character development; not only that, but the relationship between the hero and heroine is the most sincere and heart wrenching of the series. Or maybe I’m just a sucker for helpless love stories. The truth is that a good part of the book is focused on their search of a cure and on Rune’s quest to bring back Carling’s will to live, something that Thea Harrison does -or writes- beautifully. We are talking about two people that have lived for thousands and thousands of years and have seen and experienced everything. It has to be pretty challenging to write about how they fall in love and achieve their happy ending. In the previous books we read about unequal partners, Dragos is older than dirt while Pia is almost a newborn; and Tricks is 200 years old which makes her a child when compared with Tiago’s thousands of years. 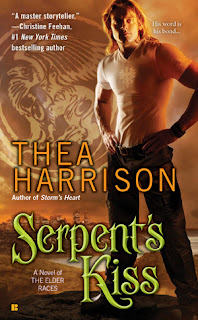 In this book Carling and Rune are both old and powerful so we have a more equal partnership and Ms. Harrison deals with their egos in a way that will make you admire her even more. In the second half of the book the story has more action and we get to see some of the characters from Storm’s Heart (The Medusa and the Djinn) and a new one, The Oracle, I guess she will be the heroine of the next book (The Djinn is the hero). Their introduction to the plot fits well into the universe that Ms. Harrison has created, and in a way makes up for the absence of the other sentinels. Again, I am a little worried about the way in which all of Dragos’ sentinels are going their own ways, but I have a feeling that they will reunite in the next installments. The story focuses entirely on Rune and Carling, for some people this could be a little boring but I think it was a necessity due to the complexity of the leading characters. Rune is a bit different from the first two heroes but in a refreshing way. Carling is brooding but likeable, her emotions are dormant, and it’s Rune’s mission to awake them. Their relationship and power adds a new twist to the plot that is impossible to see coming, and the way they discover this is really enjoyable to read. Serpent’s Kiss left me wanting more and I can’t wait to read Oracle’s Moon. Berkley Sensation. October 4, 2011. I still haven't read this book, can you believe it? I need to catch up because yesterday came out the novella True Colors and I really want to read it... I wasn't that happy with Storm's Heart but this one sounds good! Of course I believe you, you have been crazy busy doing an amazing job with the blog. This one is better than Storm's Heart (I think). Anyway, I really want to read True Colors too! I liked this one, but not as much as the other two. It is a little slower..but definitely interested in Khalil!!!! Oooh I can't read this yet because I don't want to spoil it for myself. But I so want to read this! If you haven't been impressed with the previous books my bet is that you won't like this one either. I haven't read it yet but so far Marie's has been the only positive review I have read, the others say that this one was the weakest book in the bunch. I wasn't a fan of the second book, maybe because I had too many expectations after reading the first. Having said that, I'm dying to read True Colors!